Associated Student Body senators discuss resolutions at American River College on March 8, 2019, that will be voted on at the Student Senate for California Community Colleges spring 2019 General Assembly. 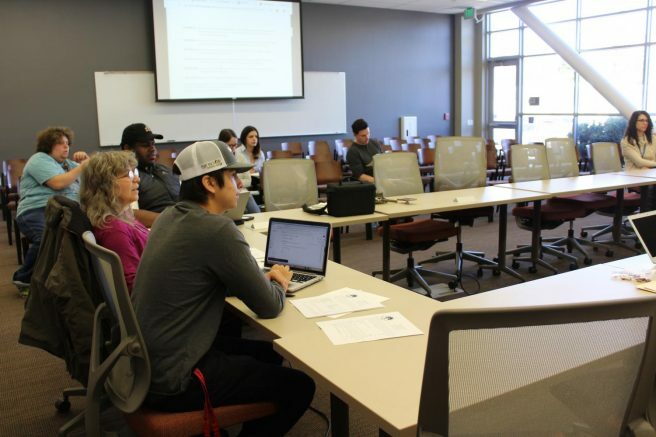 The American River College Associated Student Body met March 8 to discuss voting possibilities for resolutions that will officially be voted on at the Student Senate for California Community Colleges spring 2019 General Assembly, which will be held from April 5 to 7 at the McClennan Center. During the meeting, three General Assembly resolutions were discussed; ASB is also in the process of selecting a delegate to represent ARC at the General Assembly to vote on ARC’s behalf. The first resolution discussed was an Air Quality Policy resolution introduced by Garrett Culbertson of Las Positas College. This resolution addresses the issue of class cancellation in the midst of poor air quality and when it is appropriate. Weatherspoon said the Paradise fires were an example of how the Los Rios Community College District poorly handled class cancellation. “When the Paradise fires happened, people were still coming to class and the Los Rios District did not cancel class until the last minute when it should’ve been cancelled at the beginning of the week,” Weatherspoon said. The resolution recommends that community college campuses create an emergency stockpile of respirator masks that can be distributed at health centers, and that this will prioritize student, staff and faculty health during poor air quality conditions. The resolution also recommends the purchase of stationary air purifiers for highly used rooms on campus. The resolution states that these actions are urged and not required. ASB delegation decided to vote yes on this resolution at the General Assembly. The second resolution discussed during the meeting included Americans with Disabilities Act (ADA) compliance for all classrooms on campuses statewide, introduced by Karla Rojas and Juan Martinez of Oxnard College. This resolution recognizes that not all buildings on California community college campuses are ADA accessible. If resolved, all California community college campuses will need to make proper modifications to make all buildings accessible to all students. ASB delegation decided to vote yes on this resolution at the General Assembly. The last resolution discussed during the meeting was to ban the access codes included with textbook purchases, introduced by Iiyshaa Youngblood, Aaron Lapsley, and Juan Hernandez of Moreno Valley College. According to the resolution, the average cost of a stand-alone access code, separate from the textbook cost, is about $100. The resolution also said that there has been an increase in professors opting to use access codes and this is putting students in a position where they are paying for the grade they will receive because they are paying to do the homework. If the resolution is passed, the SSCCC will advocate to ban access codes from instruction material or drastically reduce access code usage in higher education. During the meeting, upcoming events and the retirement of previous ASB Advisor Frankie Johnson were also discussed. According to ASB Advisor Brett Sawyer, Johnson has officially retired after 25 years of service to ARC. During the meeting, a resolution was passed to allocate $90 to purchase an honorary plaque for Johnson recognizing her 25 years of service. Sawyer also said Election Day packets are due on March 18 at 5 p.m. and elections will be held on April 9 and 10. Sawyer said the Beaver Food Pantry will reopen on March 13, and volunteers will be storing food in the Hub to allow students access to picking up food on the week of March 18. Students are still encouraged to bring their own bags. The next ASB meeting is scheduled for March 15 at 10:30 a.m.
Be the first to comment on "ASB will vote on air quality policy resolution at SSCC"